Today I want to write a quick note about the best analytical balance for the money. But, before we get started let’s look at the definition of what exactly is an analytical balance. As you can see from wikipedia, their view is the balance needs to have readability of a tenth of a gram or less. However, if you go to Merriam Webster, they say that it is a balance of precision used especially in quantitative chemical analysis. So, we’re going to look at what is the best analytical balance? In my article I am going to include the balances that have a draft shield and have readability of 0.001 grams or better. Now before we start off I want to mention that this is based on experiences I have had using the balances as well as customer feedback. As we have said in the past, we try to only offer high quality products throughout the website but there are certainly better items than others. In most cases the brand name scales would win the awards. We all know that A&D, Mettler Toledo, Ohaus, and Sartorius build some of the best weighing equipment in the world. And of course if you have a large budget or you need super accuracy and reliability, these are the obvious brands to consider without a doubt. But the reality is that most of you reading this article don’t have thousands of dollars laying around to purchase one of these expensive laboratory balances. So, what item should those of you on a budget consider? Well, I’m going to list several popular choices below for you to consider. The HT-224 is a outstanding alternative choice to the expensive name brand scales and balances that we all know. The HT 224 Analytical laboratory balance from Intell-Lab is manufactured in Japan. The quality of workmanship and attention to detail on this lab balance is outstanding. There are three support points on the bottom of the balance, two of which are adjustable to provide leveling. The key to this balance is the base which contains the world renowned Vibra double ended tuning fork sensor, which gives almost instant start up because it does not require a warm up time, unlike conventional force restoration balances. More than likely, the most stable system on the market, the Vibra module is also very resilient against shipping or any movement induced damage. This is ideal since you’re probably going to be purchasing this online via the internet and then shipping it to you via UPS. The floor of the weighing chamber is lined with high quality stainless steel, an anti-buoyancy plate to ensure air currents within the chamber do not affect the weighing results and a 3.15” diameter platter. There is plenty of room for large, awkward samples to be weighed in the 7.4 x 6 x 8.25” chamber. The weighing chamber of anti-electrostatic material is easily removable to enable proper cleaning of spills and contamination, as regular cleaning is recommended. The three doors give excellent access for operations such as pipette calibration. 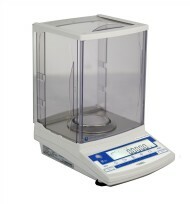 The capacity of the balance offers analytical weighing up to 220 g x 0.1 mg, and reads in 9 weighing units. The balance comes equipped with many programs to match laboratory applications such as GLP, density, parts counting, checkweighing, accumulation,Quick Cal™ calibration, adjustable backlight levels, under balance weighing and Direct to Windows via Serial RS232. The HT 224 is a complete solution to any laboratory request for analytical weighing performance and highly recommended. 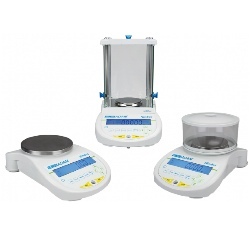 Nimbus Analytical Balances were designed for scientists by Adam Equipment. Adam offers a product range of models that deliver a full breadth of precision readabilities ranging from 0.1 mg to 0.1 gram. Innovative design enables a reduction of the balances footprint, so it occupies less space but retains the highest level of performance. A single piece of extruded aluminum forms the balance base. The aluminum provides superior thermal transfer for a more regulated temperature, while the solid core is more rigid, offering greater stability and enabling highly repeatable results. For 40 years, Adam Equipment has supplied professionals all over the globe with quality balances and scales. In 1972, the company was founded in the United Kingdom, and through the years has established a network of facilities to streamline manufacturing and distribution of its products. Now, with offices on nearly every continent, the company continues its philosophy of developing and manufacturing balances and scales that offer its customers speed, performance and value. As a business, Adam Equipment continued success and development can be attributed to the skills, dedication, enthusiasm and professionalism of employees. Adam is always prepared to go that extra mile to solve every customers needs. This is evident in their responsive customer service, which is one of our inherent features that bring customers back time and time again. Weighing scales are used daily in almost every industry. From waste disposal to developing future medicines the concept of measurement provides value, continuity and equality where there would otherwise be disruption and chaos. Adam is proud to serve these industries and meet their needs every day with reliable scales and balances. Adam is an excellent scale manufacturer that has a large presence in both the United States and world wide. Their name recognition sometimes falls a little short of the big boys like Ohaus for example but their products are very well constructed and the chances are they have a Nimbus analytical balance that will fit your needs. The HRB series of analytical balances are some of the most popular laboratory weighing accessories in North America. These scales are manufactured under the watchful eyes of LW Measurements LLC located in Rohnert Park, California. Owner Boon Lim developed all the Tree brand scales with unique AnyCAL software. The scales and balances are manufactured in facilities in Changzhou and Fuzhou China owned by Boon’s relatives. Boon has extensive experience and has served the weighing industry in international marketing, product design, engineering, and manufacturing for 25 years. Boon began working in Columbus Ohio, then Hong Kong, Singapore, Malaysia, Thailand, Taiwan, Korea and most recently in China. These balances have an affordable price tag and feature weighing units g,oz,lb,dwt,ozt,ct,tlt,tlh,tlj,gn and more. Years ago we used to sell a lot of the Virtual Measurement and Control balances. Unfortunately, those VMC balances are no longer available but if you’re used to those, then you will absolutely love these. The HRB balances also feature glass draft shields and battery power. Overall, the HRB series of balances are an excellent choice for those looking for a nice weighing solution without breaking the bank. 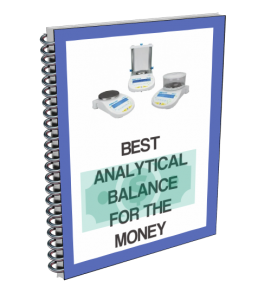 So what is the best analytical balance for the money you may be asking? Well, the answer is actually all of the above depending on your budget and features you need. All three product lines that I mentioned above are really nice “analytical” balances that are designed to provide you with accurate weighing at a specified price level. As I mentioned early in the article, these affordable choices are not meant to be of equal quality of an Ohaus Explorer or Discovery balance for example. The choices I mentioned above are well built and designed to provide you with a great level of accuracy and affordability for your laboratory. The Vibra HT series are high quality balances that you would expect to pay thousands of dollars for but you’ll pay a lot less actually. The Adam Nimbus lineup is also a well constructed line of balances that provide you with great value. And the HRB series is a great choice for those of you that can’t afford to spend a thousand bucks on a scientific scale but you do have 500 dollars buying budget to work with. Finally, I also want to mention that there are many choices to consider that I didn’t even mention in this article. The ones that I considered were the balances that I have had experience with and also the manufacturers that I have worked with in the past. There are other types of Lab Weighing Equipment in the market that I don’t have much experience with regarding their ease of use or manufacturer support, so that is a big part of why I chose to mention the scales above. I would suggest that you utilize the brands that we recommend as well since we know the brands and their performance. It’s very common these days to see a scale suddenly become available at a super low price that was imported direct from China. But watch out since often there will be little to no support or warranty for an item like that. Therefore, it’s best to stick with reputable brands like the ones I mentioned in the article. And as always you can contact our sales department and they will be happy to assist you in choosing the perfect scale for your needs.